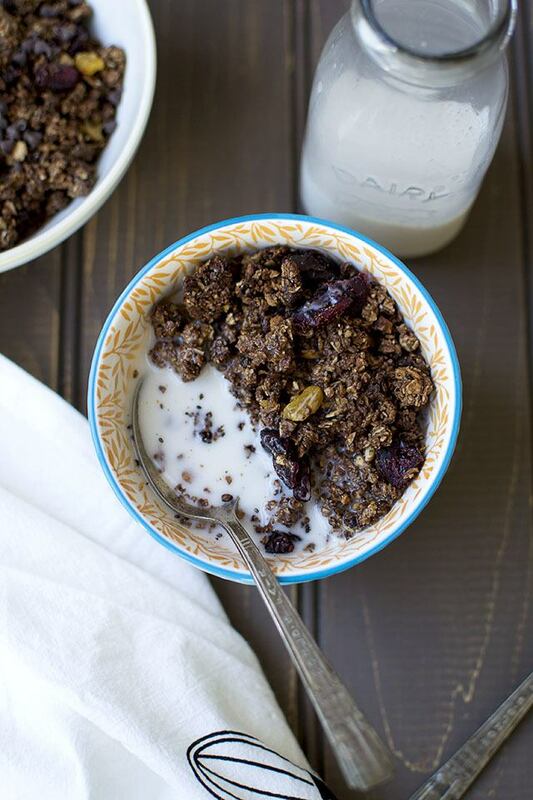 This Chocolate Granola recipe is easy to make and takes just a few minutes to put together. It has a delightful clumpy texture and is absolutely delicious. In a small saucepan, combine coconut oil and maple syrup. Cook on low heat until the oil is melted into the maple syrup. Turn off the heat and keep ready. Combine oats, nuts, coconut flakes, cocoa powder, chia seeds, sugar and salt in a food processor (or a large mixing bowl) and pulse until combined. Stir in the melted coconut oil mixture and pulse for a few times to mix all the ingredients together. Using the food processor makes the ingredients smaller and stick together. Transfer the oats mixture onto a baking sheet and bake for 20~24 minutes or until the granola is crispy and crunchy. Remove from the oven and stir in the dried fruit (if using). Let it cool for a minute and then add the cacao nibs and chocolate chips. Store in an airtight container for up to 10 days.